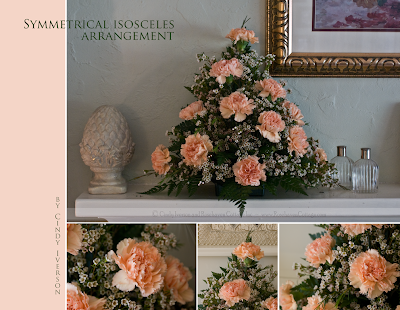 Today (week 8 in my floral design class) we learned how to construct a symmetrical arrangement based on an isosceles (equilateral) triangle. It was an interesting challenge because each of us had a different vase so each arrangement had to be proportioned to the vase that would contain it. My container was a low plastic container so my arrangement ended up smaller and tighter than the other arrangements in the class. But I found the proportions easier when it came to achieving the triangle (which is kind of tricky when you're using round-ish flowers). The other advantage to my arrangement being smaller was that I got done earlier. Since the triangle arrangement we were doing only contains a dozen main flowers (carnations in this case), I had leftovers of both my carnations and my wax flower. Since I had leftover time as well, I did up a quick symmetrical round arrangement for practice in a container I had in my tool kit--a goblet I found at the thrift store. Once I got both arrangements home, I was happy to find that they fit perfectly on our fireplace mantle out of the reach of kitties that are dying to munch on the greens. The mantle ended up being a fine place to photograph both arrangements as well. You're doing a fantastic job! Any plans for using this in the future? I think it is cool you make it and then you get to keep it at home. LOVE IT! You did a fabulous job... I know you are loving this. Your creativity is shining through. They look lovely on your mantle. Don't laugh! But whenever I see that you've made a new post (I follow you on my Google Reader) I get so excited as I wait for the page to load... it's almost like Christmas! And speaking of Christmas, your triangle arrangement looks like a baby Christmas tree... only in pink. Do you pick up your own flowers? the instructor? different from week to week? Both arrangements are just beautiful. Sweet. I especially liked the round one. 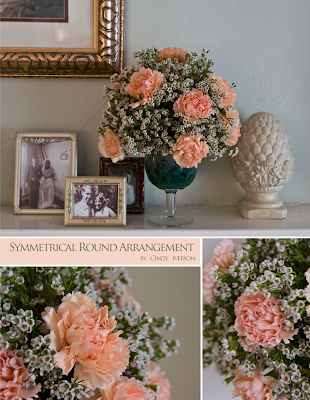 My husband, a scientist, would love the geometry/floral arrangements! I'm sure these concepts you are learning will help you in all areas of your art! Very pretty! Your arrangements look lovely! Keep up the good work!